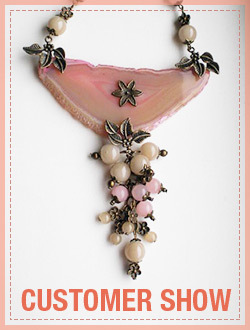 By making a beaded leaf pendant and adding a chain, you can own such a charming necklace. Follow my instructions and I promise you it’s very easy to make. 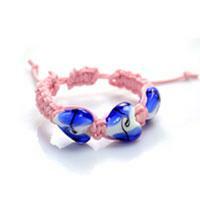 Learn how to make a bracelet with elastic cord and shank buttons in pandahall learning center. You will find more surprises that beyond your expectation. Learn how to make a personalized alphabet beads bracelet in pandahall learning center, and make a personalized beads bracelet to show your identity. 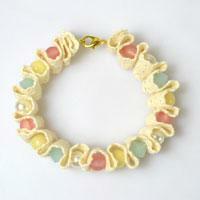 Learn how to make a lace bracelet with colorful beads. 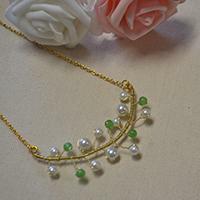 You can make a beaded lace bracelet within 10 minutes. Do you want to make leather bracelets for women? This tutorial will show you a simple way to finish off a cool black leather bracelet. If you can tie square knot, you can make a bracelet! Here is a primary pattern on making a bracelet with suede cord by using such square knot technique!